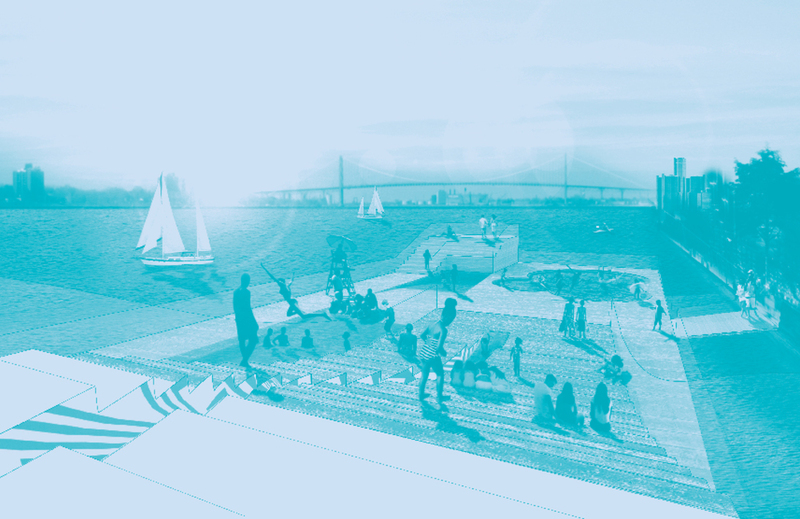 We are working on the research and design of healthy, sustainable locations to swim outdoors in Detroit's neighborhoods and collaborate with international experts and local stakeholders on their realization. Of the former more than 15 existing outdoor pools offering the residents of Detroit a splash during the hot summer month, only Brennan Pool in Rouge Park and Belle Isle Beach are currently open for the city's 750.000 residents. Dip and Dive in the D developed several types of new ways to swim outdoors throughout the city, addressing not only the need to provide recreational programs in the neighborhoods but as well defining places for people to meet, get involved and enjoy the hot summer months during a refreshing splash together. The projects introduce Natural Swimming Pools as a more affordable and sustainable alternative to conventional pools but as well provide new solutions to reimagine Detroit's abundance of fresh water as a resource for outdoor swimming. Find out how you can get involved. Find out more about the history of Detroit's outdoor pools. Interested in building a pool or pond in your neighborhood, volunteering with us or just learn more about the project? We are excited to meet you to talk about possible collaborations.